Last Updated: 8/13/2012 | File Size: 16847 KB | Price: $19.95 | Downloads: 99 | Developer: Digiarty Software, Inc.
MacX iTunes Video Converter is a powerful yet Mac iTunes video conversion software which provides a perfect solution to convert iTunes video from all popular video formats, including MKV, M2TS, AVCHD, AVI, MPEG, FLV, F4V, RM, RMVB, WebM, Google TV, etc. In addition, users are also allowed to convert videos to MOV, MP4, YouTube format FLV and MP3 music files with this faultless iTunes video converter on Mac OS X. 1.Convert all the video sources (both HD and SD videos) to iTunes format MP4, H.264 (.MP4) for importing into iPhone, iPad, iPod and Apple TV. 2.Support converting video to MP4, MOV, YouTube FLV on Mac. 3.Support Multi-track HD Video, such as M2TS, MKV, AVCHD, HDTV BDAV and MPEG-TS etc. 4.This Mac iTunes video converter totally supports AVCHD, MOD, TOD, MTS videos which are recorded by Panasonic, Canon, JVC, and Sony HD-Camcorder. 5.Extract audio to MP3 music and take snapshot from video. 6.With batch conversion applied, you can convert more than one file at a time. 7.Split video into segment to fit your apple devices. 8.Support Multi-core CPU and Hyper-threading, which offers you up to 8x real time converting speed. 9.Personalize profile by adjusting video's resolution, frame rate, bit rate and sample rate etc. Statement: First, please download the orginal installation package by clicking the download link. Of course you may also download it from the publisher's website. Using MacX iTunes Video Converter crack, key, patch, serial number, registration code, keygen is illegal. The download file hosted at publisher website. We do not provide any download link points to Rapidshare, Hotfile, Depositfiles, Mediafire, Filefactory, etc. or obtained from file sharing programs such as Limewire, Kazaa, Imesh, Ares, BearShare, BitTorrent, WinMX etc. Software piracy is theft. 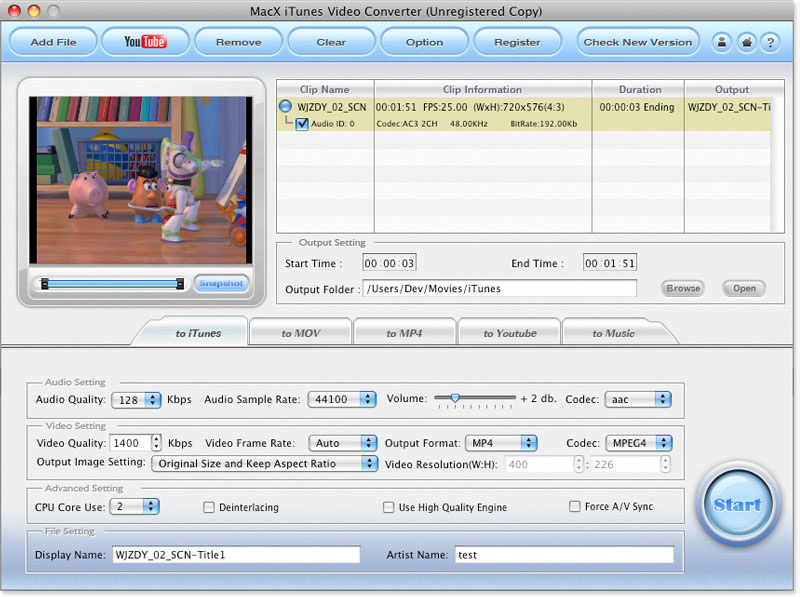 If you like MacX iTunes Video Converter please buy it.